New Passenger Walkway in New England! - Welcome to EAST ISLAND AVIATION SERVICES, Inc. 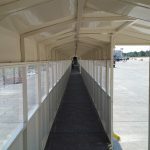 Welcome to EAST ISLAND AVIATION SERVICES, Inc.
New Passenger Walkway in New England! 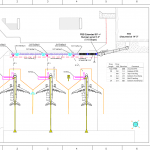 Earlier this year the Portland Jetport installed a new passenger walkway connecting the jet bridge at Gate #11 to three remote hard stands. As traffic increased by double digits, the airport had to come up with a quick solution to gate the aircraft and protect passengers from the overflow apron. Airport Director, Paul Bradbury turned to East Island Aviation for a quick and economical solution. Having worked with East Island Aviation in the past he knew we were the right choice. 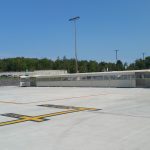 Our in-house aircraft planners came up with a fully enclosed passenger walkway that connected the Jet Bridge to all three hard stand parking spots. 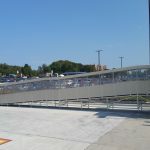 The walkway incorporates a full floor and is engineered to meet the heavy snow loads typical in the New England States. Currently passengers exit the main corridor across a short walk to the three KCI Ramps but the airport is intending to install three Commute-A-Walk® systems to completely protect the passengers to the KCI Ramps later this year. 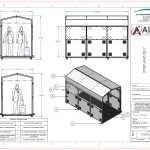 For more information on fixed and retractable passenger walkways, please contact us. 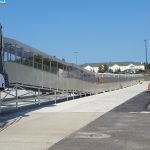 This entry was posted in News and tagged passenger walkway, retractable passenger walkway on September 4, 2018 by Jim Larson. Commute-A-Walk To The Rescue Again In Chicago ORD! United DASH-8 Passengers Are Dry & Safe At EWR! United Airlines Launches EWR Inter-Terminal Airside Bus Operations! Copyright © - 2019 East Island Aviation Services. All Rights Reserved.